When you first purchase your home, you want to put your own mark on it. After years spent in the same home, you often want that mark to look a little different. Whether you're a new homeowner looking to make your mark, or one who's looking to shake things up in your home of ten or twenty years, T.L. King Cabinetmakers in Montgomery County can help make it happen. Window walls often get stuck with leftover odds and ends when it comes to decoration. The placement of the windows leaves homeowners stumped as to how to make use of the square footage, so they hang a picture or two and call it done. 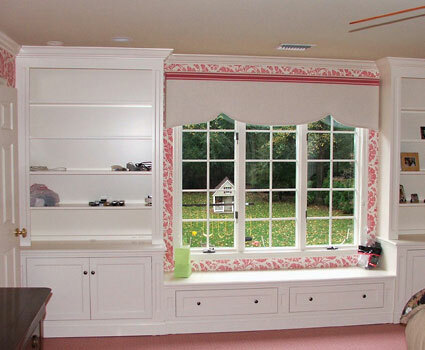 Window-wall cabinets are a great way to make use of that space, however. The installation of the right window-wall cabinets will give you plenty of storage space while also framing the windows. Whether you live on a farm with a stunning view of open land or a more densely populated area, the right cabinets can make that wall and the view beyond it a thing of beauty. Working from home allows a lot of flexibility and freedom, but it also requires that you be self-motivated and productive, as well as be able to store paperwork, equipment, and other work-related items. You could go to an office supply store and buy a boring metal filing cabinet... or you could build a custom computer desk and cabinets that fits the existing style of your office. Enjoy the benefits of working from home to the fullest with get some custom home office cabinets instead? Turn an entire wall into storage space, add some custom bookcases to hold your reference books, or get some built-in shelves to display awards, knick-knacks, or degrees. Choose your wood, colors, and style so that your office space is entirely yours. Create a warm and welcoming home office that not only makes you feel productive and comfortable but also invites in any potential clients or colleagues that may join you from time to time. Even if all you use your office for is to write checks to pay the monthly bills and check email, surround yourself with home office cabinets that you chose, instead of cold, sterile choices from an assembly line. Make the experience of paying bills and checking email feel like a luxury rather than a chore. Do you, or someone in your family, love to read? 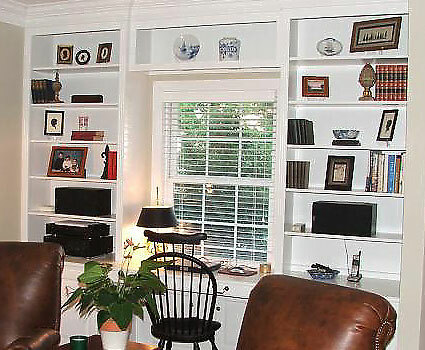 Give the readers of the house their dream: custom bookcases that create the library of their dreams. We can help you design custom bookcases that can grow with your child, or ones that display your fabulous collection of mystery thrillers or how-to books. Devote an entire room to bookcases, or install one in each bedroom and the living room, customized to each room's occupant and needs. Contact us to see how we can help you upgrade your home with custom cabinets and window-wall units!